Former Zanu PF and government officials linked to former president Robert Mugabe have claimed that they are being persecuted for their past political association with the ousted despot by President Emmerson Mnangagwa’s regime. The November 19 central committee meeting resolved to expel G40 members Phelekezela Mphoko, Innocent Hamandishe, Kudzanai Chipanga, Letina Undenge, Samuel Undenge, Walter Mzembi, Makhosini Hlongwane, Mandi Chimene, Dickson Mafios, Wonder Mashange, Xavier Kazizi, Tongai Kasukuwere, Mpehlabayo Malinga, Tapiwa Matangaidze, Anastancia Ndlovu, Jappy Jaboon and Paul Chimedza. The cabal was allegedly led by former First Lady Grace Mugabe backed by Jonathan Moyo, Saviour Kasukuwere, Ignatius Chombo and Patrick Zhuwao — who have also been expelled. Zanu PF central committee member Daniel Shumba, who was expelled during Friday’s extraordinary congress, said he was not fired in terms of the November central committee resolution. “So when and which central committee resolved my expulsion?” he said from Haiti where he is attending parliamentary business. “No one has or is able to prefer a charge against me, because they just isn’t any. Having an independent mindset or alternative views is not a violation of any Zanu PF statutes. “Everyone knows how I was abused for taking part in the Tsholotsho meeting, and now am subjected to purging for not conforming to factional dictates,” he said referring to the 2004 Tsholotsho meeting called to plot former president Mugabe’s ouster and the then Midlands godfather’s ascendancy to the presidium. “The people are not fools they can tell that am being victimised for no cause. God is my salvation and redeemer. The truth shall set me free, because my hands are clean. “I shall accordingly congratulate Cdes July Moyo, Lovemore Matuke, Paul Mangwana, Jorum Gumbo, Josiah Hungwe on their victory. It was indeed a good fight against me, know God shall recompense you in good measure,” he said. Shumba was one of six Zanu PF provincial chairpersons suspended in the Tsholotsho debacle that sought to block the elevation of Joice Mujuru to the vice presidency in 2004. After his suspension, a livid Shumba formed an opposition party United People’s Party (UPP) two years later, and in retaliation, the Zanu PF government suspended the licence for his TeleAccess, which was poised to be the second fixed line company in Zimbabwe after TelOne. In the 2008 parliamentary election, the party put forward 79 candidates for the House of Assembly and 27 for the Senate in eight of Zimbabwe’s 10 provinces, but failed to pick up a single constituency. Shumba, a retired Zimbabwe National Army colonel, was denied a chance to run in the 2008 Zimbabwean presidential election after allegedly arriving late at the Nomination Court. He later won a court application, but the judgment was issued well after the re-run election. Shumba, initially resigned from politics in October 2009, to continue his role as a business leader in Zimbabwe before retracing his footsteps to Zanu PF after dissolving the UPP. Meanwhile, the Zimbabwe Anti-Corruption Commission is reportedly investigating G40 kingpins including former Foreign minister Walter Mzembi and his Mines counterpart Walter Chidakwa for corruption and abuse of office. Mzembi, through his attorney Job Sikhala of Koto and Company Legal Practitioners, expressed “dismay at the incessant allegations” he said were being conveyed through the media. “Furthermore, he is not oblivious of political persecution and a sense of retribution and vengeance, a facade and clone of the Nuremberg trials by those failing to heed...Mnangagwa’s clarion call to desist from political witch-hunting of comrades who may have fallen out of favour with the current political dispensation,” Sikhala said. “These (attempts) will be responded to and every essential detail concocted over the years to soil, and destroy or break … Mzembi will be shared with the public only from a court of law in defence and mitigation,” his attorney said. It is alleged Mzembi abused office in relation to vehicles he got during the United Nations World Tourism Organisation General Assembly which Zimbabwe and Zambia co-hosted in 2013. He also stands accused of awarding contracts to his wife, Barbara, without going to tender. Chidakwa, who was unreachable for comment, allegedly used his influence to unlawfully grant tax exemption to a mining firm, which then made a hefty payment to an organisation linked to the former minister. Other members of the faction including former Finance minister Chombo have since been charged with corruption while others including former Local Government minister Kasukuwere and his Higher Education counterpart Moyo are still at large after they allegedly skipped the country. Another G40 kingpin, former Harare provincial political commissar Shadreck Mashayamombe told the Daily News in a Facebook interview that he had nothing to fear as he has not committed a crime. “Iwe handina wandinokumbira ruregerero wangu, (I have nothing to apologise for) I can have a very prosperous life outside the party. 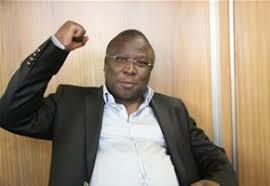 What I hate is propaganda,” Mashayamombe said.